The first has some merits. But the second is my favorite. 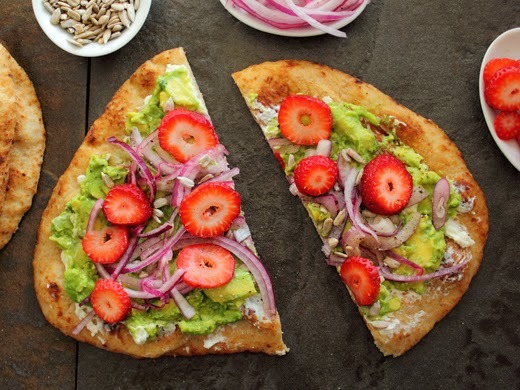 The experience of finding just the right combination that works for you, of figuring out the precise balance of those bracing red onions to avocado to cream and cotija cheeses to crunchy sunflower seeds to sweet strawberry slices that makes your particular taste buds sing. Too often, we need our snacks to be quick. To be eaten with only one hand while the other is engaged with wrangling a small child, clicking away at a keyboard, or steering the wheel of a vehicle. Yet there is a lovely beauty in the solitude of blocking out the responsibilities of the world and concentrating on your own nourishment. Perhaps one will share this snack with others. Perhaps not. If sharing, one may find oneself in a parallel play of sorts, building your snacks side by side, suiting the snack to each individual’s taste buds. I like to call it "parallel eating." Eventually, the snack time comes to an end, and one resumes attending to all those responsibilities that were pushed aside. But the memory of snack time lingers until dinner. Need to ripen your avocados? This Cooking Light article will tell you how! Place the sliced red onions in a bowl. Drizzle with lemon juice, and sprinkle with salt and pepper. Using a mixer, beat together cream and cotija cheeses. Mash the avocadoes with a fork. Drizzle with lemon juice and sprinkle with salt and pepper. To assemble the flatbreads, spread cream cheese mixture, then avocado mixture. 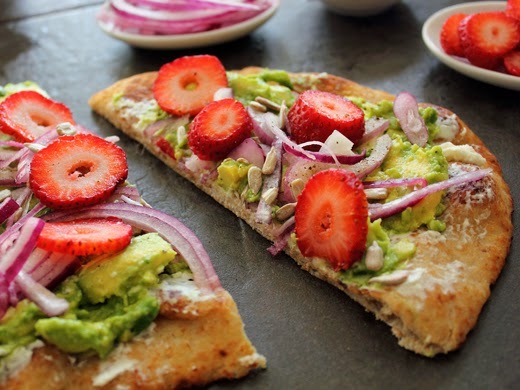 Top with red onions, sunflower seeds, and strawberries. Sprinkle with more salt and pepper to taste. Especially the pepper, it truly makes the flavors pop. Love the combo! You gotta love a snack that can come together in a matter of minutes. Yum! ohh this is perfect warm weather food, I could see myself having this for dinner with a nice cold beer! Yum. The combination of ingredients is wonderful and it looks scrumptious. I'm definitively preparing it for my lunch break in the park! It looks fresh and healthy! This looks amazing!! and thanks for that link to tell me how to ripen avocados - good to know! !